October was a very busy month for us here at Feheley Fine Arts, with the release of the 2018 Cape Dorset Print Collection, our very successful Quvianaqtuk Pudlat: Drawings show and Art Toronto. The evening of October 18th, though, was something special – a memorable night for all who attended. We were so pleased to host Anna Gaby-Trotz, artist and technical director for Open Studio. Anna’s talk was about her 2016 collaboration with Tim Pitsiulak as part of an artist exchange between Open Studio and Dorset Fine Arts. Cross-cultural projects appear to be an ongoing theme for us this fall, on the heels of our Convergence North/South show that brought together Inuit artists Qumaq Iyaituk, Mary Paningajak and Passa Mangiuk with Lyne Bastien, a Quebec-based printmaker. Anna’s work with Tim Pitsiulak was a personal career highlight for Anna. She showed a series of slides she shot when Tim was in Toronto at the Open Studio, helping him with his Bowhead Whale print. She noted how rare it is for the artist and printmaker to work together, given the immense cost of travel in the North. But Anna and her colleagues at Open Studio invited Tim to provide direct input into the process. 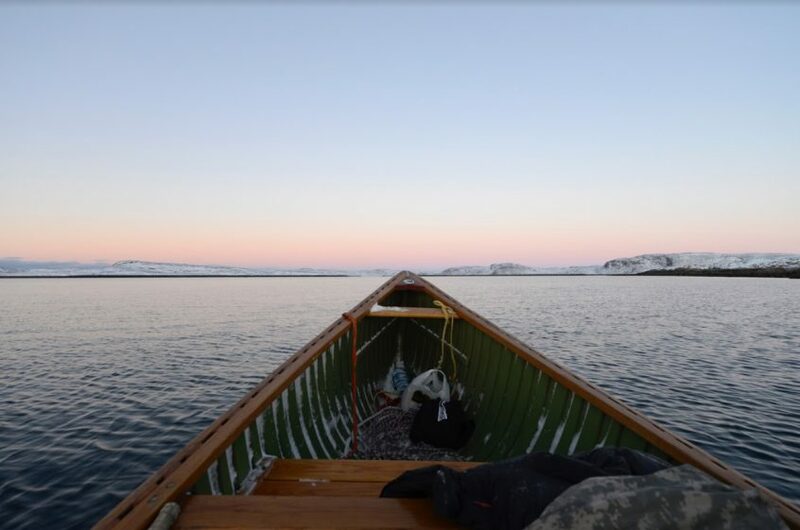 As part of the artist exchange, Anna then went north to Kinngait for a return visit with Tim. He took her out on the land to experience nature as he did. He took her out on his boat on a long, cold day of fishing, where she developed frostbitten toes due to inadequate footwear. But Tim’s incessant cheer was irresistible. Those memories came vividly back to life during Anna’s talk and left the audience as emotional as the speaker herself, with the knowledge that the exchange took place merely months before Tim’s untimely death in late 2016. Watch the videos of Anna Gaby-Trotz’s presentation below.